The issue of what members of the National Assembly – Senators and House of Representatives members earn, in salaries and allowances, annually or monthly, will continue to elicit public interest and generate discussion for some time. So much has been written and said about the take home pay of the 109 Senators and 360 members of the House of Representatives. As a matter of fact, Nigerian lawmakers are generally believed to be the highest paid among their counterparts globally. 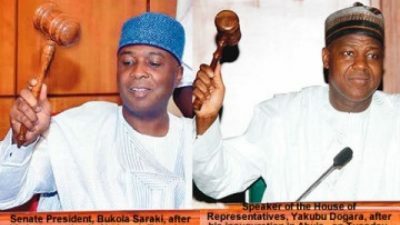 A comparative analysis of the salaries and allowances of federal lawmakers in Nigeria vis-a-vis some other countries in the world, certainly, lends credence to this belief. A Senator in Nigeria, according to available information, takes home N36million monthly or N432million annually. A Senator in the United States, US, Parliament, as at 2017, went home with $174, 000 annually, equivalent to N62, 988, 000, and that figure still stands. * Car Allowance (400% of B.S) – N9,936,982.00. The Emir of Kano and former Governor of the Central Bank of Nigeria, CBN, Mallam Sanusi Lamido Sanusi, in a letter to President Muhammadu Buhari sometimes ago, had said, “Change should start with the National Assembly. He questioned a situation whereby a Senator receives N36,000,000 (thirty-six million Naira) monthly. If this is divided into two = N18,000,000 million (Eighteen million Naira). The second half which is N18,000,000 (eighteen million Naira) can be used to employ 200 Nigerians, each earning a salary of N90,000 (ninety thousand Naira) monthly, Sanusi argued. “When you multiply 200 people with the number of Senators (109), this will give 21,800 Nigerians gainful employment. In short, 200 Nigerians will be able to live a comfortable life on half a Senator’s monthly salary. “A member of the House of Representatives receives a salary of N25,000,000 (tenty-five million Naira) monthly. If this salary is divided in two = N12,500,000 (twelve million and five hundred thousand Naira). The other half, which is the sum of N12,500,000 (twelve million and five hundred thousand Naira) will be enough to employ 135 Nigerians with a monthly salary of N92.500 (ninety-two thousand and five hundred Naira) each. “Nigeria has 360 Members of the House of Representatives, half of their salaries can employ 48,600 Nigerians who can live comfortable lives. “Nigerians, spread this message to Senators and Members of the House of Representatives and others prick their conscience if they have any and to let them know how many Nigerians are not working because of their greed. Transformation should start from the Congress”, the former CBN Governor said. Commenting on the same issue sometimes in 2014, a newspaper columnist, Denrele Animasau, wrote, “No wonder the Nigerian Lawmaker fights tooth and nail to stay on the gravy train. It is a known fact that Nigerian Lawmakers are the highest paid in world. “There are 109 Senators and 360 members of the House of Representatives so in terms of payment by result, the Nigerian lawmakers do not deserve such high pay and surely does not perform their duties to warrant such hyper inflated pay. “In America, a Senator earns 174,000 US dollars and in the UK, a Member of parliament about 64,000 US dollars a year. So what do our lawmaker do for this generous amount can someone please tell me why they deserve this enormous amount of money. It is about time Nigerians demand better service and improvement for Nigeria and Nigerians. “No one deserves that much money while ordinary people are scavenging to make ends meet. Nigeria has got multitude of deprivation; high infant mortality rate, maternal mortality rate, malnutrition, inadequate health care and transportation and lack of electricity outage, high crime rates, high number of young people not in education, employment or in training. “So why are some of these excesses going to improve the lives of Nigerians. So instead Nigerians lawmakers are paid for below par performance and disregard to the electorates that they are meant to represent. I feel that ordinary Nigerians have been severely short changed, cheated and insulted by these so called honourable people. Animasaun, in the said column, quoted an erudite Professor of Law, Itse Sagay,as equally saying that “the Nigerian lawmakers at the lower and upper chambers of the National Assembly are the highest paid legislators in the world. A senator in Nigeria earns 240 million naira (about 1.7 million US dollars) in salaries and allowances and a member of the House of Representatives earns 204 million naira (about 1.45million US dollars) per annum. It definitely rubs insult to injury for the average Civil servant who earns about 46 to 120 US dollars per month. These salaries of the Nigerian Senators and House of Representatives members become a serioys issue for concern when they are juxtapised with the average salary of Nigerian worker, based on the national minimum wage, which is N18,000.00. So, the yearly salary of a Nigerian worker is N18,000.00 x 12 = N216,000.00. Will President Muhammadu Buhari ever act on the letter by the Emir of Kano and former Governor of the Central Bank of Nigeria by looking at the recommendations made? Time will tell.